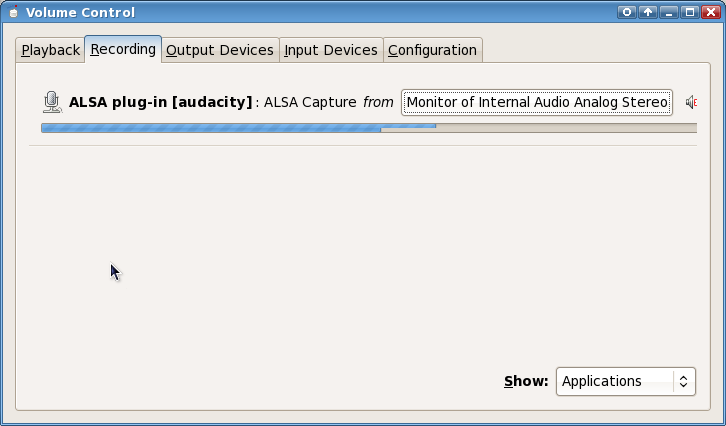 I discovered a neat trick you can do with PulseAudio: redirect the audio output of your computer to the microphone input, so that any application that supports recording from a mic will get your audio output instead. I needed to do this because I was testing something at work that involved an Asterisk server calling a softphone running on my Linux box, and it wanted me to record a voice prompt and then hang up. This computer didn't have a microphone installed, so I started looking for a way to fake the mic input and make it record an MP3 or something instead. This is pavucontrol on the command line, and in Fedora is provided by the package pavucontrol. 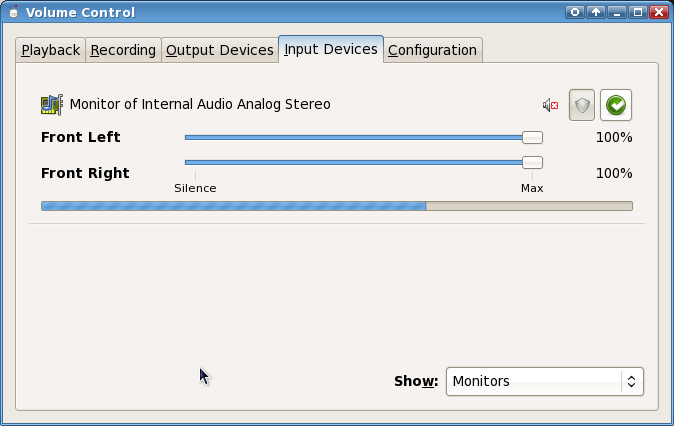 The "Input Devices" tab showing monitors. 2) Start running an app that is recording audio, and go to the "Recording" tab and see if your app is listed. In this screenshot I'm running Audacity and recording audio. And that's pretty much it. If you see volume bars on the Recording tab now then it's probably working, and the recording app is now recording your audio output. 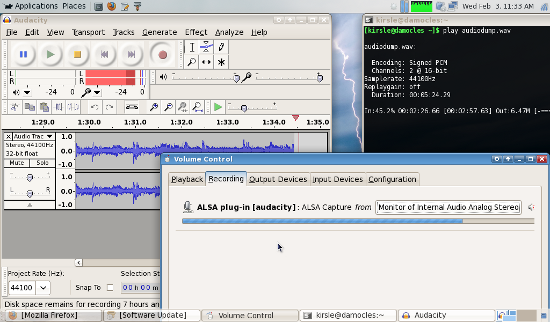 Here's a full desktop screenshot of me running `play audiodump.wav` (a WMA-to-WAV conversion of the Windows XP Welcome Music) in a terminal, the PulseAudio Volume Control running, and Audacity recording from the mic. There are 18 comments on this page. Add yours. yeah, really helped especially with google voice and espeak, thanks. Wow this is great, works perfectly. Fantastic, thanks, I've been trying to work out how to do this for a long time. thanks man! I knew about PulseAudio, but didn't know it can redirect sound. Much appreciate! How to do the exact oposite? Im participating in some video conferences and im making some kind of echo because of this. I was banging my head on this problem for the past month! Thanks so much! 5 years ago and still helping. thank you! got the job done. What about recording both the mic AND the output stream? hey, i see this works. but there is an echo. on my recording software, how can i fix this? I've been trying to find a reasonably decent recording of Tchaikovsky's 1812 Overture with cannons and chorus for a good few years now - classical music is getting harder to find through most of my usual channels. The only place I've had any luck has been YouTube, and although kissyoutube/savemedia.com exists, this song is longer than that service allows for. Thank you for helping me replace this fundamental classic in my library. Is there a way to do this completely from the command line for a Linux system that isn't running X at all? Wow....really a great tip, very useful, in my case, to generate closed captions for on line videos that does not provide this feature =) Thank you so much for sharing this tip !